1. Choose your turnout times. If your horse has a stall, but is turned out for part of the day, provide turnout during the cooler hours. Overnight is ideal, but if that’s not possible, provide turnout as early as possible during the day. 2. Give your horse shade. 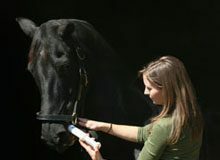 If your horse lives outdoors, or if it must be outside during the day, provide relief from the sun. A run-in shed is best. Trees are a source of shade, as well, but as the sun moves, so will the shade. Make sure that, regardless of the time of day, available trees are really offering shade. 3. Move that air! Fans are a great way to help keep the air moving in the barn, but use them wisely. Your horse will benefit most if the fan is pulling the hot air out of the stall, not pushing air into the stall. And always ensure that your horse cannot reach cords and plugs. 4. Mist it. If you are fortunate enough to have a system to mist your horse, use it. As the moisture is absorbed from your horse’s skin, it will take away some of the heat, as well. Frequent mistings are far more effective than a single dousing with a hose. 5. Lead your horse to water. Make sure your horse has plenty of fresh, cool water. A bucket hanging on a fence will get warm, and will no longer be appealing to your horse. Left long enough, the water will also become stagnant and unhealthy. If you are providing clean, cool water and your horse doesn’t seem to be drinking, encourage it by providing a salt block, or even by misting hay with salt water. 6. Offer electrolytes. 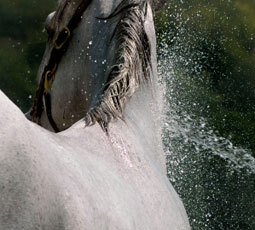 If your horse is sweating a great deal, water laced with electrolytes can help keep its body in balance. Whenever you offer electrolytes, however, be sure to offer fresh water, as well. Too many electrolytes can be harmful. 7. Slow down the work. Don’t think that because your horse has been working intensely at 1 pm every day that it can take the heat when the temperature tops 90 degrees. If you have to work your horse in the heat, lighten the work or spread it out over a couple of short sessions. This is especially important when the humidity is high, contributing to the poor quality of the air your horse is breathing. 8. Stick to a schedule. Within the parameters of keeping your horse cool, try to stay as close as possible to a normal schedule. Too much change at one time can be an invitation to colic. 9. Horses, especially white horses, can suffer from sunburn. Even those with white socks and blazes, pink noses or even hairless patches from scarring can be susceptible. Using a fly scrim can help. In addition, applying sunblock to small, particularly vulnerable areas can be effective. Staying out of the sun’s harmful rays will, of course, be best. (Also be aware: if a horse has excessive sunburn, it could indicate a rare, underlying liver disease). 10. Clipping horses with longer hair coats is important, especially those with Cushings disease. 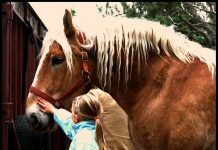 While some coat can provide protection from the sun and insulation, a long, thick coat tends to hold heat and makes it difficult for the horse to cool down. Penn Vet is one of the world’s premier veterinary schools and is the only school in Pennsylvania graduating veterinarians. Founded in 1884, the school was built on the concept of Many Species, One MedicineTM. The birthplace of veterinary specialties, the school serves a distinctly diverse array of animal patients at its two campuses, from companion animals to horses to farm animals. For more information, visit www.vet.upenn.edu. Good article. I didn’t know horses could get sun burn. Fly mask are great, but do not leave them on all the time, dirty can be ground into the material, and get the eyes infected. Wish everyone would follow this advice.